I’ve never been big on taking vitamins. I’m not big on taking anything in pill form. I make an exception for my antidepressant medications, and I have recently decided to start taking a B-complex vitamin supplement. Research has shown that low levels of B vitamins – particularly B-6, B-12 and folic acid – may be linked to depression. Apparently the connection isn’t totally clear to scientists, but an article at livestrong.com tells us that “B vitamins help maintain blood cells and nerves through complex biochemical reactions in the brain… [and] also help several of the body's neurotransmitters function properly.” One of the affected neurotransmitters is dopamine, which boosts our ability to experience pleasure. B-12 and folic acid also help prevent the buildup of the amino acid homocysteine in the blood. According to an article at suite101.com elevated levels of homocysteine, a byproduct of protein metabolism, can lead to cerebral vascular disease and neurotransmitter deficiency, which can lead to depression. Vitamin B-12 can be found in animal products like fish, meat, poultry, eggs, milk and cheese, as well as dark leafy greens. Other foods, such as breakfast cereals, are sometimes fortified with B vitamins. B vitamins can’t be stored in our bodies, so we need to replenish them daily. They can also be destroyed by alcohol, refined sugars, nicotine, and caffeine, so it may be necessary to supplement our intake, especially for vegetarians and people over the age of 50 (or we could stop our intake of alcohol, refined sugars, nicotine and caffeine, but who wants to do all that?). Suggested levels for adequate supplementation of B-12, B-6 and folic acid range greatly, especially when we start talking about making up for deficiencies. Some sources caution that vitamin supplements can interact with other medications and cause additional medical concerns, so consulting a doctor before taking supplements is recommended. Also, vitamin supplements are just that – supplemental – and are not a replacement for antidepressants or psychological counseling. I’m starting to sound like one of those TV drug commercials where they show people smiling and enjoying life – supposedly due to the wonderful drugs they are taking – while the voice-over cheerfully goes on at length about all of the potential side effects and morbidity rates. You can look online at the potential risks of taking supplemental vitamins and make your own judgments. As for me, I’m going to live on the edge and try B vitamins. I only wish the capsules were smaller. So! I got really excited when I went over to blogger Mandy's site at findvitality.com and read about a month-long challenge to eat only unprocessed foods. The challenge is the brainchild of blogger Andrew at eatingrules.com. (I know... so many blogs, so little time). I got even more excited when I realized it’s almost the end of this month! I would only have four days to psych myself up for this challenge if I was going to participate. But I really need a kick in the pants to get my eating habits back in line, so I was determined to go for it. 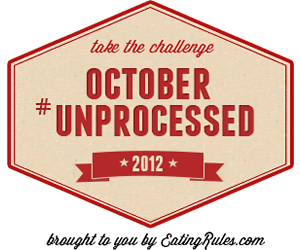 And then I paid a little closer attention to the bold red lettering on the big logo that says "Take the challenge OCTOBER UNPROCESSED 2012." Whew!! I’ve got a whole month to prepare for this. And so have you! Avoiding processed foods is a big tenet of the Paleo Diet philosophy. So if I were keeping to the eating rules that I had aspired to in July when I wrote the post about Ice Cream Day, I would be way ahead of the game. But that’s not exactly the case. I’ve let my diet slip away into the Twilight zone of unpronounceable ingredients, decades-long shelf lives, and (gasp!) fast food drive throughs. That doesn’t mean you have to make everything from scratch; it just means that you would be able to make it if you were so inclined (without the use of your science lab chemistry kit, that is). Easy peasy. To learn more and to take the pledge, hop on over to eatingrules.com. It’s free and I’m not even getting anything out of telling you about it (except good cholesterol karma). Mind you, I have some differing opinions than Andrew on what healthy eating consists of, but as long as he’s not championing an “eat only processed foods all month” campaign, then I think it’s a good cause. So gird your loins, people, and get ready for an unprocessed October!